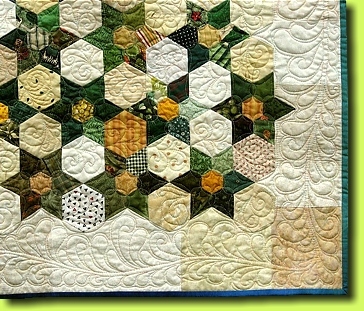 Beautiful pattern for classic English paper piecing. The ideal on-the-go project for travel, vacation, and waiting periods. Use even the smallest scraps effectively. for endless printing on your own printer. Look for more pictures in the Gallery and the Guest Gallery. My quilt measures 125x170cm (42"x68") and consists of 135 star flowers. Smaller hexagons and diamond variations make up ~5 ¼" six-pointed Star Flowers which are then joined with larger hexagons to make the top. 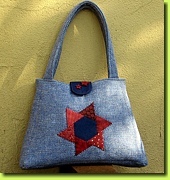 The top is pieced by hand using the English paper piecing method. Instructions are included. You only need standard sewing tools, no special equipment is necessary. 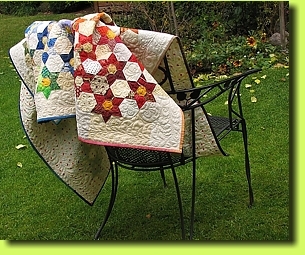 This pattern is ideally suited for scrap quilts. So-called Jelly Rolls, bundles of coordinating fabric strips, are also perfect for cutting the petals. 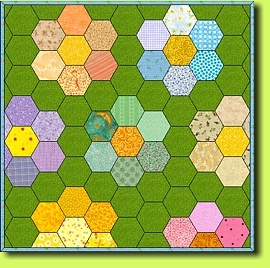 In addition, you will need fabric for the large hexagons and for the border. I used an assortment of cream-colored fabrics. After quilting it on my longarm machine my quilt turned into a jewel. 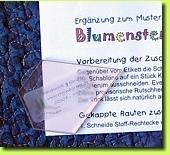 In Germany you may take advantage of my professional quilting service. Have a look at the matching pattern Louise. 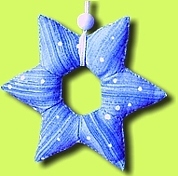 Three dimensional stars make a nice Christmas tree ornament. for efficient rotary cutting of many Star Flower leaves. Additional tips are included. This window template helps to fuzzy cut motifs or repeating pattern parts as for kaleidoscopes. To make coasters like these the additional "Else" pattern is needed. (1) Plus shipping: Germany 1,90 €, worldwide 3,90 €.